hecha verdad a fuerza de pueza. To make a poem was to plan the perfect crime. whose purity made it true. There are few English translations of the great and often difficult Carlos Martínez Rivas (1924–1998), a passionate and linguistically brilliant Nicaraguan poet – celebrated throughout the Hispanic world, but still almost unknown to English readers – who raised a “solitary insurrection” against society’s oppressive orthodoxies and hypocrisies. A handful have appeared over the years in journals and anthologies, but these are the first to be published as a collection. 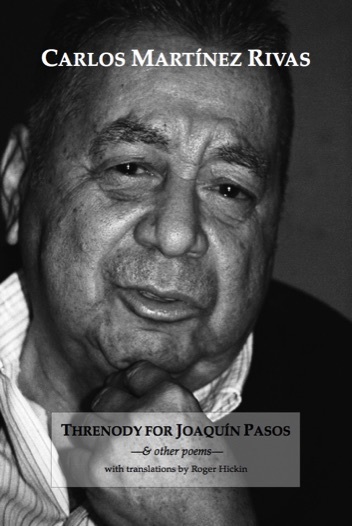 An aversion to public success and its trappings, along with a dread of typographical errors, contributed to his reluctance to see his work in print, and El paraíso recobrado (Granada, 1943) and La insurrección solitaria (Mexico, 1953, reprinted numerous times) were the only books of his poetry he permitted to be published in his lifetime. The first was a long metaphysical love poem published when he was only eighteen, the latter included what is widely regarded as his masterpiece, “Canto fúnebre a la muerte de Joaquín Pasos”, a funeral poem for his great friend and fellow poet, Joaquín Pasos, who died in 1947 at the age of 33. In Los Años de Granada (2002) Ernesto Cardenal has written of the young Martínez Rivas: “. . . I never knew anyone, anywhere, with the genius for poetry Carlos had in those days. Add to this his fabulous memory, his scintillating conversation, his charm, his sense of humour, his guitar. Lorca must have been just like him.” Alcoholic in later life, and “at the mercy of his art” (to borrow John Berryman’s phrase about Mozart), he could be “difficult, problematic, solitary . . . One had to approach him with caution” (José Coronel Urtecho in Conversando con Jose Coronel Urtecho, ed. Manlio Tirado, 1983). His collected poems, Poesía Reunida de Carlos Martínez Rivas (Anamá Ediciones, Managua), edited by Pablo Centeno-Gómez, was published in 2007. Como toca un ciego el sueño (Anamá Ediciones, Managua), an anthology chosen by Centeno-Gómez, appeared in 2012.
they’re thoroughly drilled in the practice of Nothing. among the smoke and mockery agree. Even so, my dear Joaquín, we carry on. Don’t worry. We’ll redouble our ritual bardic rancour. Our happy little leaps of loathing. Drift on in the quiet waters of your dream. I won’t be judging you. raise my voice against Death. she blushes at the utterance of so much grief for the dead.